Can a Taoist-quoting bookworm solve the mystery? As many of you know, I have a bad habit I can't break: I keep writing all sorts of things: hundreds of blog posts, essays, non-fiction books and the occasional novel. I haven't kept my deep, dark shameful past a secret: my university degree is in philosophy. I slip this factoid into the blog from time to time, the way one reveals some impractical, idealistic, whimsical side of oneself that simply doesn't play in our cynical, faux-confessional, everyone-is-playing-everyone-else culture. I confess my dream job would be Consulting Philosopher. Since no such job exists, I created a fictional Consulting Philosopher, Caverlock Victor Oliver, who after two years finally has a client. My idea was very simple: to write something that would provide some modest entertainment while waiting at the airport, etc. On the eve of a wedding, what to do when the groom mysteriously disappears? When the police and private investigators come up empty, what's a desperate bride to do? Call in the man with no qualifications: Caverlock Victor Oliver -- the world's only Consulting Philosopher. Will he prove there's no mystery that can withstand his prodigious powers of Applied Philosophy? Will he succeed in reuniting sweet Victorine with her lover? Can a Taoist-quoting bookworm solve the mystery ... and will he be paid? How much do you pay a Consulting Philosopher, anyway? 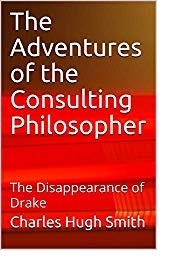 The answers to these questions (and many more you would have never thought to ask) are all found in The Adventures of the Consulting Philosopher. "I can’t believe it—you actually have a client." The Consulting Philosopher shifted his substantial weight on the office’s velvet draped divan and looked up from the tattered paperback in his hand at the astonished expression on his assistant’s endlessly charming face. "Your wonderment is exceeded only by my own, JP," he replied, his deep voice easily audible in every room of the sparely furnished flat. "But let’s reserve our absolute astonishment for a client’s payment of cash." Read the first three chapters for free.